You have likely heard about voice search by now. In fact, you may even own a device with search by voice technology such as Google Home or your smartphone with Google Assistant. Many marketers believe that this is the next big thing in search and customer behaviour patterns and the common advice from these marketers is that everyone needs to jump on the train now or risk losing out and being left in the dust by competitors. It is true that usage of voice search is up – way up in fact, but does this mean that there are real marketing opportunities for businesses if they take advantage or implement this technology? The answer to this question is not exactly a simple one however it can be simplified and the answer is that it really depends. If you are making electronic devices for example such as tablets, smartphones, or personal computers and laptops then you have likely already integrated voice search or applications such as Google Assistant in the operating system so your target customers will already be making purchasing decisions with your embedded tech in mind. Aside from the obvious, there are several applications where voice search makes a lot of sense and others where it will likely not present any opportunities to market your business. See the main thing about voice search is that people utilize it to assist with activities that do not require their focus or attention. As we all know advertising is all about grabbing a customer’s focus and attention (even if just for an instant). 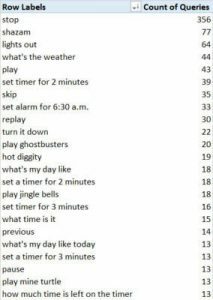 So the patterns you will see across voice search queries are usually things like “Play Netflix” and “Read My Text Messages” etc. It is not as common for someone to search something they plan to spend some time or give some attention to filtering results such as “Find me a local plumber”. This is usually something that potential customers will want to sit down and devote some comparative shopping time towards choosing the right contractor. If you are the developer of an application that can be made easier to use with voice commands then features such as voice search can be extremely beneficial. 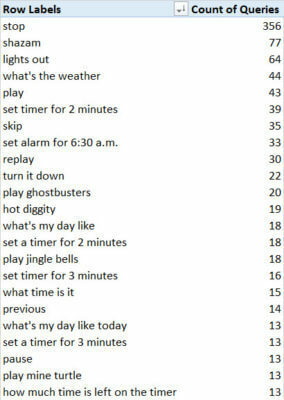 Take a look at some of the voice searches performed by an example user and you will see the pattern in what types of things that users utilize voice search for on their devices. 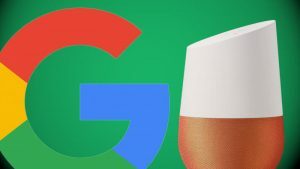 At the very least, we can agree that voice search marketing opportunities may be present for some industries and products but it has its place. The data that voice search provides can definitely offer some insight into customer behaviours. When thinking about the impacts of voice search in Google and how that impacts customer searches marketing opportunities, keep in mind that voice search ultimately translates into a “text search” just hands free and via a translator that auto-magically converts your words into a traditional string search. We have been implementing voice search into some technology for a tourism website, I’m Local in Grenada to help tourists ask questions through the app such as “What can I do today in Grenada” and this will be translated into a text search behind the scenes and matched to the events calendar of upcoming tours. In this case, there is a huge marketing opportunity by setting up kiosks in hotel lobbies where tourists and visitors can ask a computer on a wall for tour suggestions. In this case words are turned into cash and happy smiles on tourist faces. This is to show a real world example of voice search technology and how Creative Designs is always keeping up with emerging technologies to help our clients achieve extraordinary results. It’s time for you to become extraordinary too – give us a call for Ottawa website design, search marketing, search engine optimization, or custom coding for websites, applications, and apps. Let’s building something amazing together.